At the centre of every business is the customer. While many businesses engage with outsourced customer service providers to reduce overheads and streamline their customer service provisions, many face challenges if the third party is unable to provide the same level of customer service that is expected from the organisation. The customer doesn’t know (and often probably doesn’t care) if they’re speaking to someone directly from the company or by an agent elsewhere – as long as their call is resolved. They will associate any customer service experience, whether it is good or bad, with your company. That’s why it is essential that when selecting the right outsourced call handling provider, that they must be able to integrate with your culture, operations, and marketing strategy to deliver a consistent brand message to the end customer. Check to see if the contact centre has had any previous experience in your industry or similar industries. If they do, this could mean that their agents are ideally experienced for looking after your customers efficiently. Always look at their case studies for proven experience. What is their track record? Do they uphold an extensive amount of testimonials proving the efficiency of their contact centre? Supplying excellent customer service eliminates unnecessary steps in resolving your customers’ issues and can help to increase customer satisfaction. 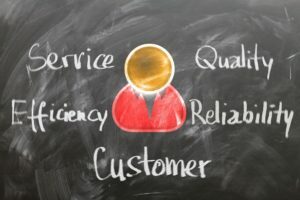 To retain customer loyalty, you need to provide them with a satisfying service that leaves them feeling that their issue has been resolved in a professional manner. Even though you are outsourcing your customer service, there still needs to be excellent communication between you and the provider. You need to choose a supplier that understands your business requirements and can easily communicate to your in-house team to create a seamless customer experience. Having well-trained agents is something you need to look for when choosing your provider. How often are the agents trained? How efficient is the training programme? These are questions you need to ask, and you could even ask to observe a training session to comprehend if this training is best suited to your business style. Is there room for growth? Are you planning on expanding your business in the near future? If so, you need to make sure the provider can accommodate your continuous growth. Otherwise, you will be in the same situation in just a couple of months, finding yourself having to look for another customer service provider. For further information about what to consider when selecting your outsourced customer service provider, please get in touch on 0800 0835 159. We are more than happy to help you make your decision. Expert contact centre solutions for your outsourcing, overflow and out of hours needs.